Let the sights of Tokyo be your starting off point on a journey to discover the hidden gem of Ōita. Getting from A to B in Japan is ridiculously easy – there are trains and planes dashing this way and that constantly, linking compelling cities, regions and islands that each possess traditions and culture that beg to be experienced. Ōita is one such place, an undiscovered gem nestled on the island of Kyushu. To get the best of both worlds, stay a few days in the Japanese capital of Tokyo, searching out interesting neighbourhoods and unique experiences, before jumping on a plane for the approximately 90-minute flight into Ōita Airport (ANA and JAL both have regular flights). Here, the perfect itinerary for four days of discovery. Start your exploration of Tokyo by strolling the pavements of Kappabashi Dougu Street (located between Asakusa and Ueno, both accessible by train), also known as Kitchen Street. As the name implies this roughly 800-metre long thoroughfare is lined with around 170 stores selling all manner of kitchen utensils, gadgets and gizmos, as well as shops offering up sweets, treats and essential ingredients. After wandering past everything from woks to coffee pots to chopsticks, pick up a souvenir from one of the jam-packed ceramics shops that are stacked with bowls and cups finished in lovely traditional colours including blue and white, greens and browns. If you walk to Chomeiji Temple you can taste sweet and sticky sakura mochi – pretty pink concoctions wrapped in salted cherry tree leaves and filled with bean paste (30 minutes from Kappabashi Dougu street). Tokyo- (Kanto) style mochi is smooth and round while the Kyoto (Kansai) variety has a grainier texture; both are delicious. After a morning of walking it is time for a lunch of fresh sushi. To really appreciate the effort and craft that goes into making this national favourite, head to Hassan in Roppongi (just a few minutes’ walk from the station) for a hands-on sushi-making experience: don a traditional happi coat (a traditional short robe), learn the history of sushi, get a live demonstration of how fish is prepared before making your own rolled sushi and nigiri sushi, which you can then enjoy with a beef hot pot (you’ll also take home a sushi experience certificate). Finish off the day at Ameyoko, a bustling shopping street once famous for selling candy but that now also has clothes, shoes and food shops for trying popular snacks among the locals. The narrow alley has an impressive history but is also a reflection of modern Tokyo life, where throngs of locals come to eat great food and have fun. First thing this morning you will need to head to Haneda Airport (it’s an easy train ride straight into the airport) for your short flight south to Ōita, on the island of Kyushu. Jump in a Limousine Bus for the roughly 30-minute journey to Kitsuki from Ōita Airport, a town possessing the authentic feel of the Edo Period (it is recognised as a ‘historic cityscape with kimono’). Dominated by Kitsuki Castle, there’s a collection of historic samurai residences dotted on the hills to the north and south of it and a merchant’s town sitting in between. You can dress up in a kimono while you’re here (they can be hired for around 3000 yen), which gains you free admission to local sights, discounted meals and little gifts at local shops. Having soaked up the history of Kitsuki, it’s time to continue your journey to Usa Jingū, the sacred main sanctum of more than 40,000 Hachiman shrines that are dotted throughout Japan. The main hall here has been designated a National Treasure and its colour and history make for a fascinating visit. The Usa area of Kunisaki peninsula, including Usa Jingū, is the birthplace of ‘Rokugo Manzan’, the cultural fusion of Shinto and Buddhism. You’ll find spectacular temples in the area and this year marks the 1300th anniversary of the founding of Usa Jingū. Check into an onsen hotel in Beppu, where you’ll find seven out of 10 types of Medical Treatment Hot Springs and a modern take on a traditional Japanese aesthetic. Don’t miss the opportunity to take a bath in the onsen to soothe your mind and body after a busy day exploring. Today, head to the Usuki Stone Buddhas (approx. 80 minutes by JR and bus), a group of stone Buddhas created from the late Heian (794-1185) period to the Kamakura period (1185-1333), of which 61 are designated National Treasures. Wander the different collections of Buddhas – they are divided into four groups – appreciating the scale, quantity and incredible quality of the statues, as well as the peaceful beauty of the surroundings. We recommend an izakaya (pub) for a dinner of fresh seafood, and an extensive selection of sake to choose from. Back at your hotel in Beppu, make the time for another bath in the onsen. The seismic activity that has been warming your onsen water for the last few nights also produces a totally unique tour that you should take before leaving Ōita: Beppu jigoku meguri or the hell tour. 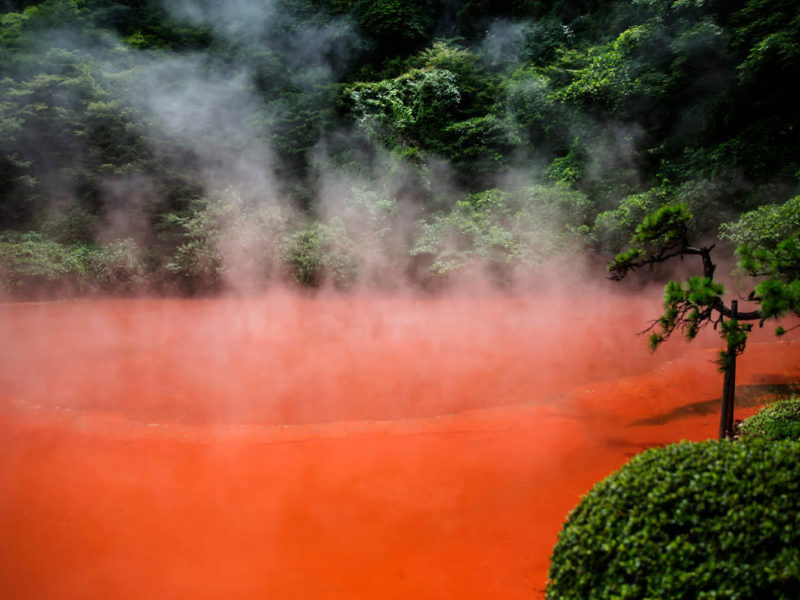 There are seven hells in all where fumaroles and boiling hot water erupt from the ground; the evocative Umi Jigoku (sea hell), Chinoike Jigoku (blood pond hell), Tatsumaki-Jigoku (tornado hell) and Shiraike Jigoku (white pond hell) are among them, all of which have been designated as National Scenic Spots for their fantastical colours and formations. Next it is time to take buses back to Ōita Airport for the flight back to Tokyo. Do some last-minute shopping here for specialty souvenirs and food from across Ōita and Kyushu to remember your experiences of this quintessential Japanese gem. The add on all your friends will be jealous of!